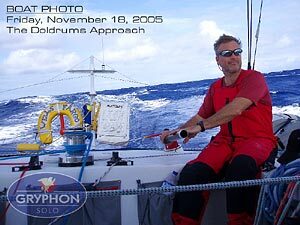 MARBLEHEAD, MA - Nov 21, 2005 - The US yacht, Gryphon Solo, co-skippered by American Joe Harris and Briton Josh Hall, became the first Open 50 monohull to cross into the Southern Hemisphere today while competing in the gruelling 4,500 mile Transat Jacques Vabre ocean race. Shortly before 14:00 GMT Gryphon Solo crossed the equator once again reiterating its dominance of Class 2 with the closest competitor, Artforms, more than 200 miles astern. "It feels great to be first across the equator," Joe said in a satellite phone call. "I know it's just a line of latitude, but we feel that it has some real significance. We are now through the doldrums and into the trade winds, and with that incredibly tricky region behind us we feel that we are on track to win this race." The Anglo-American duo aboard Gryphon Solo battled ferocious squalls and torrid heat as they transited the Inter Tropical Convergence Zone, or doldrums, but they are now sailing in steady winds with 805 miles to go to the finish in Salvador, Brazil. The Transat Jacques Vabre is one of the world's premiere ocean races held bi-annually racing from Le Havre, France to Salvador, Brazil. It's contested by both mono and multihulls and raced double-handed, that is with just two crew on board. Gryphon Solo is one of two American entries in the race, the other being the Maine-based entry Artforms skippered by Kip Stone. Gryphon Solo has dominated Class 2 from the outset and the crew have had to deal with a wide variety of sailing conditions from gale force winds in the Bay of Biscay to calm conditions off the African coast. Gryphon Solo's owner, Joe Harris is training for the 5-Oceans single-handed around-the-world race to be held in 2006/07. "This has been an extraordinary experience for me," Harris said. "It's perfect training for the 5-Oceans. Having Josh on board to train and mentor me has been invaluable. If we win this race it will give us a confidence boost going into 2006." For audio files, photos, and daily updates go to www.gryphonsolo.com. To arrange an interview with Joe either while en route to Brazil or once across the finish line, please email bhancock@gryphonsolo.com.